Tonight I made a cute and yummy treat. I was inspired by the cover of Family Circle magazine (which I can't find on line anywhere so sorry no link). 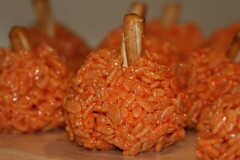 We all love Rice Crispy treats so I thought how hard would it be to make them into pumpkins? The answer: Not hard at all. I used some red and yellow food coloring to die the marshmallow and butter mixture before adding the crispies. 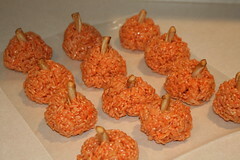 I shaped them into balls and stuck a half of a pretzel in the top. (My trick for non-sticky hands is to dip my hands in water before handling the mixture. They aren't soaked, just damp.) I thought it looked realistic to have some of them misshapen. Very cute. Dad just bought some Rice Krispies tonight to make treats. Maybe we'll try these. They "did" look very good, which is why I couldn't stop myself from eating them. Good thing you took these great photos to remember them by. So cute. The only thing to make them better would be if they were drenched in chocolate. Do you think this is an option? What a fun treat. Have you thought about compiling a "Rice Krispy Treats for Every Holiday" book? Leave it to Janel to bring chocolate into any discussion regarding sweets. I think her challenge is a good one. I wonder if someone has already written that book?